The Skylanders: Spyro’s Adventure video game needs no introduction. As one of the world’s most popular releases in October 2011, it didn’t take long for many other companies to snap up the rights to create ranges of toys, gifts and trading cards based on this phenomenal franchise. 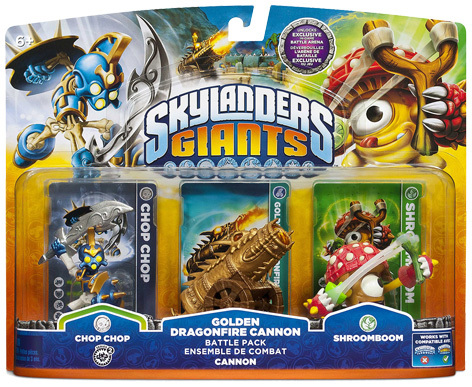 The launch of the second game Skylanders: Giants in October 2012 coincided with a massive launch of new toys. These include action figure in various sizes and detail, with all the most popular characters represented at lift-off. Shrooboom, Chop Chop, Crusher, Bouncer and Swarm are just a few of the collectable figures that feature in the game. Some like Prism Break, Drobot and Eruptor even light up when placed on the Portal of Power! Distributed to UK retailers by The In Thing, the Skylander products also include wallets, backpacks, jigsaw puzzles and stationery, as well as Topps trading cards, calendars and Skylanders stickers. Construction toy company Mega Bloks are also in on the action with a series of Skylanders building sets that feature scenes from the video game. Please tell us what you think of Skylanders Giants.